Media that has been imported into a project is often called footage. You can preview footage by using the Footage panel, which is one of the panels hidden by default. You can easily display the Footage panel by choosing Window > Footage: (none). 1 Display the Footage panel by choosing Window > Footage: (none). This will open an empty panel that is standing by to preview a piece of footage from the Project panel. The Footage panel automatically opens when you double-click on any item in the Project panel. If you have previously used the Footage panel, the name of the last item you viewed is displayed next to the panel name in the Window menu. You preview still images and video files in almost exactly the same way. The only major difference between the two is that video footage has a time ruler so that you can adjust its duration. 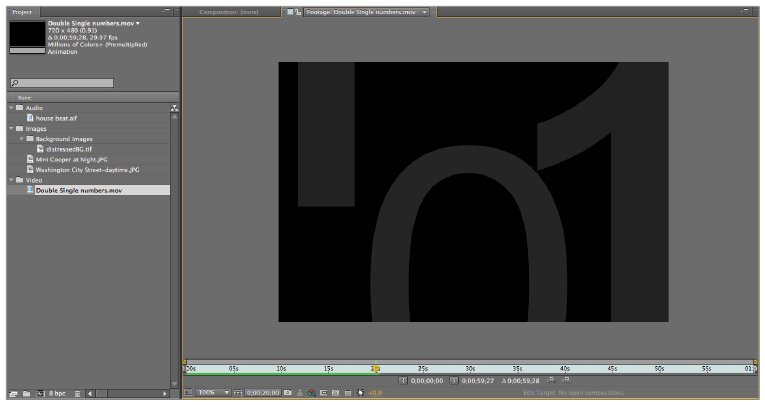 1 In the Project panel, double-click on Double Single numbers.mov to load it into the Footage panel. The text on the tab of the Footage panel changes to “Footage: Double Single numbers.mov,” to indicate that you are previewing a specific footage item. 2 With the Footage panel highlighted, press the spacebar on your keyboard to begin the video preview. 3 Once you see the animation begin to play, you can press the spacebar again to stop the preview. Press the spacebar to start and stop the animation. If you click and drag the playhead along the time ruler, you move backward or forward through the video file. You can use this technique, called scrubbing the playhead, to navigate quickly to a specific time in the file. Remember that this is not a real-time preview; the speed at which you scrub the playhead controls the playback speed. 4 Double-click the Mini Cooper at Night.jpg file to see how easy it is to preview still images as well. Do not close this file; you will need it in the next part of the lesson. As is the case when working with the Project panel, you can always press the tilde (~) key while the Footage panel is highlighted in order to expand it to full screen mode, giving you a larger preview area. Just like video and still image files, you can preview audio files using the Footage panel. While an audio file is loaded into the panel in the same way that any other file is (by double-clicking on it), pressing the spacebar does not cause the audio to play in the same way that video does. To preview audio files, you will use a RAM preview. 1 In the Project panel, double-click on house beat.aif to load it into the Footage panel. Unlike when you previewed the video and image files, the Footage panel appears as a blank, gray screen. The name of the audio file displays in the Footage panel tab and you see a time ruler for the duration of the audio file. Since it is an audio file, there is no visual preview. 2 With the Footage panel still highlighted, locate the Preview panel on the right side of the workspace and click the RAM Preview button. You can also initiate a RAM Preview by choosing Composition>Preview>RAM Preview with the Footage panel highlighted. 3 After a brief pause, the audio file begins to play. When you are happy with the preview, click anywhere in the interface to stop the playback. 4 In addition to creating a RAM preview of your composition you can also preview audio while scrubbing the playhead. If it is not already there, move the playhead to the beginning (0;00;00;00) of the composition. Hold down the Ctrl (Windows) or Command (Mac OS) key on your keyboard and click on the playhead and drag it back and forth across the timeline to scrub it. You will now hear audio previewing as the playhead moves. 5 Save your file by choosing File > Save or by pressing Ctrl+S (Windows) or Command+S (Mac OS) on the keyboard.